I don't generally advertise or promote the fact that I make these, but I love makin' 'em! 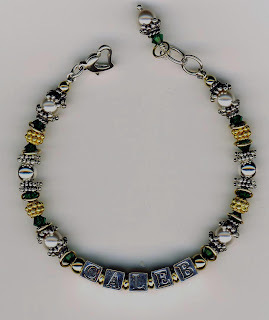 Mostly because the women for whom they're meant wear 'em to death : ) It's difficult not to love a piece of jewelry with your child's (or grandchild's) name on it. Trust me .. I've had to restring more than a few of these due to wear n tear. Both of these examples went to the same woman .. CALEB was a gift from me and my husband to his Administrative Goddess at the Remington Museum when she had her son in the spring of 2006; BRIELLE was a gift from her to her partner's sister, who just had a baby in March (the pale blue crystals represent aquamarine, the traditional birthstone for March). As the first one was a gift from us, I was at liberty to get a little crazy - hence the vermeil (pronounced ver MAY) beads, the addition of the little gold-filled jump rings that move around freely (you'll probably have to double click on the pic to see them), and the heart-shaped lobster clasp. (Vermeil, by the way, is 24k gold over sterling .. at least that's the traditional definition). Temporarily back on track ..